JMC Recruitment, recruitment notification, Jobs In Jammu, J&K Govt. Latest Jobs, Jammu Municipal Corporation Recruitment 2018, JMC Class IV Posts Detail, JMC Safai Karmchari Jobs 2018, Application Form, Apply Through Online Mode,Last Date 31 July. 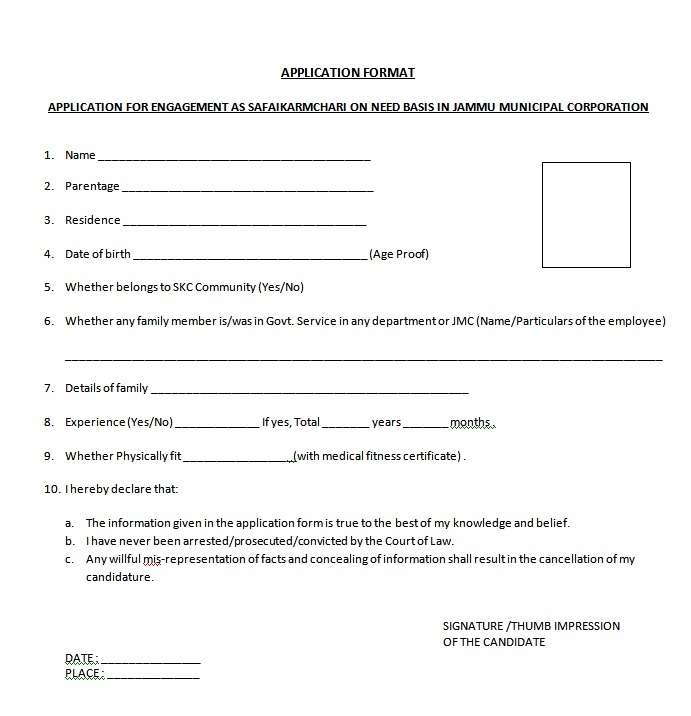 JMC Jammu Municipal Corporation Recruitment 2018: We have good news for those candidates who are looking for a government job in Jammu (J&K), Jammu Municipal Corporation has invites applications on prescribed format from the eligible candidates of J&K state to fill the posts of Safai Karmchari on the need basis. For more details read the official notification given below. Municipal Corporation of Jammu recruitment for the posts of Safai Karmchari is the best opportunity for the candidates who are waiting for a Government job from a long time. Interested candidates can check their eligibility by reading the official notification before filling the application form. 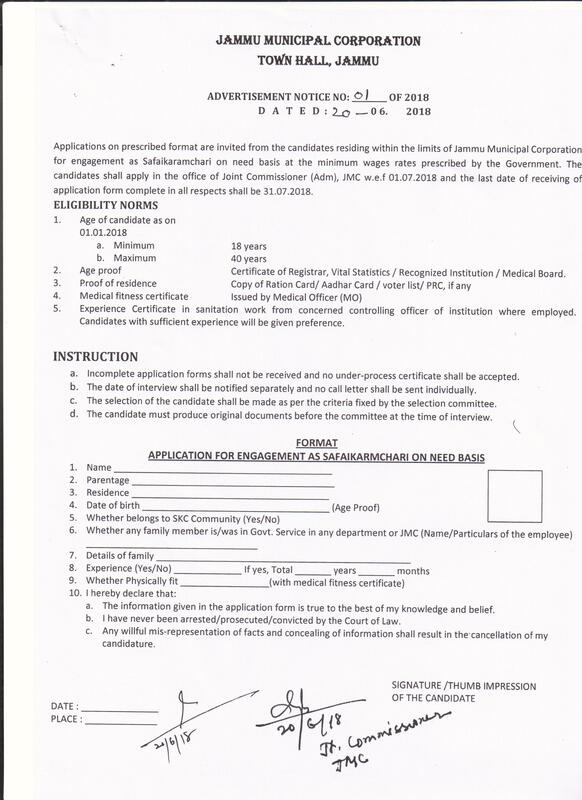 The Municipal Corporation of Jammu (J&K) has offered a job opportunity to the eligible candidates of Jammu who comes under the municipal limits. Interested candidates can apply on the prescribed format available on the official website of the Jammu and Kashmir municipal corporation. 1. Age Proof: Certificate of registrar/vital statistics/recognized institution/medical officer. 2. Residence Proof: copy of ration card/voter card/permanent residence certificate (PRC) if any. 3. Medical Fitness certificate issued by medical officer (MO). 4. Experience certificate in sanitation work from concerned controlling officer.